Concepts: Value, grayscale, achromatic, emphasis, contrast, shadow, highlight, narrow value, broad value, high key, low key, mixed key, open-value composition, closed-value composition, scale, visual hierarchy, movement. Designate a new section of your Creative Process Book and write ‘Value-Added Portraits’. In your CPB compose a minimum 2-paragraph description, with specific references to the images, indicating how the key sets the mood of the composition. Also notice and report how the forms in the composition create highlight and shadow relationships, some may be abrupt other may have a gradation of value from light to dark. How does this contribute expressive quality (mystery, drama, success, joy, etc) of the compositions? Post your paragraphs and 2 final images (high key and low key) to the OpenLab class discussion topic. 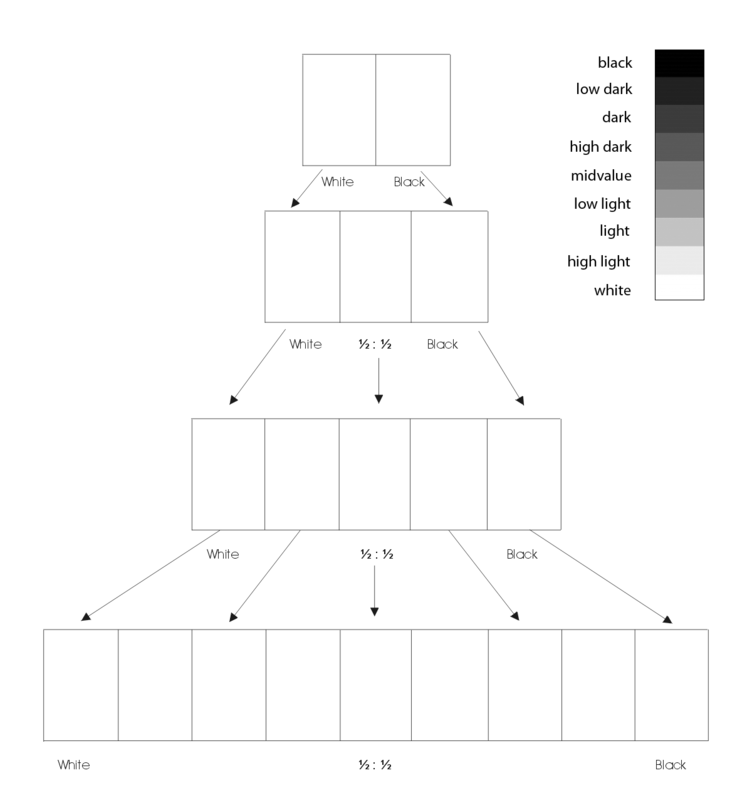 Create a Value Scale (a graduated scale of achromatic gray tones). On a piece of 9×12″ bristol, use this guide to create 4 scales starting with 2 steps and ending with 9 steps ranging from black to white in even, progressive increments. You may want to do a few practice runs on a piece of scrap bristol. Try mixing black and white in a variety of proportions until you get a progression from light to dark and the paint application is smooth and free of brushstrokes. REMEMBER: That adding 50% black + 50% white may not get you a perfect middle value!All mediums are different, you need to experiment. Don’t worry, you’ll get the hang of it! Mix a very small amount of water thoroughly into the paint, for each value you create. The consistency should be like whole milk or cream. Before you apply paint to paper make sure it’s completely mixed in the palette to produce a flat consistent appearance. We want flat, blocks of paint with no streaks or brush marks. Wash your brush after each value is mixed and applied. Keep two containers of water, use 1 for washing your brushes and 1 for adding water to paint. Use a paper towel or rag to get excess paint and water off the brush before mixing a new value. Use non-stick tape along the edges of each square to create a sharp painted edge. Wait for the paint to dry completely before removing. If your completed scale is not accurate and does not produce even, progressive value increments, repeat the exercise. Escape Hatch: If your edges end up being very sloppy or uneven, you may also cut out and remount the value steps on a fresh piece of bristol. Goal: Create two 6″ compositions that demonstrate a sense of MOVEMENT, a clear understanding of changes in VALUE from white to black, and an understanding of EMPHASIS and VISUAL HIERARCHY. Using the printouts of the portraits taken last class, transfer the grid provided to the backside of the printouts. Use the light table. Measure, mark in pencil, and cut out each square carefully. Use variety in scale to develop contrast, hierarchy and emphasis. Some of the squares in your grid should be small, some large, some medium. (Both) Emphasis: create a focal point wherein one area or element is emphasized (even within the narrow range) through size, placement, value contrast, or isolation. (Both) Value Transitions: use value steps to support transitions from one compositional element to another. Take a photo of your finished and approved collage, just for future reference. Make sure each square of your composition is properly marked on the back, indicating the TOP and numbered from left to right, top to bottom. Use a small piece of tape on the back of each square to adhere them to a piece paper. Using your collage pieces as a visual reference, you will be painting each square independently from the next. This is VERY important. 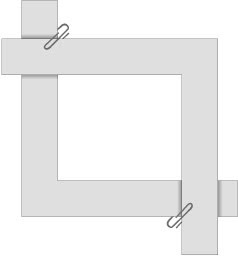 Create a viewfinder frame, so that you only see one square at a time while you are working. Using your Value Scale as a guide, recreate (in gouache paint) each photographic square using a range of black, white, and gray values- achieving continuous tone in areas where highlight and shadow blend together. Do not worry about accurately rendering an eye, nose or ear, think only in terms of value, the boundaries of each value shape relationship. When you have completed your first composition carefully protect all elements with a piece of clean tracing paper and cardboard. Then start work on the second. We will cut and mount both the paintings together in class. Goal: Using photoshop, create a Narrow Value Range composition that demonstrates RHYTHM/REPETITION, a sense of MOVEMENT, and an understanding of EMPHASIS and VISUAL HIERARCHY. Open your photo-portrait file in Photoshop. Create a new file: 8.5″x11″, 300 pixels per inch, grayscale. select portions of your original photo portrait and copy and paste them into the new document. Use the Move tool (V) + Command/Apple key and click on the pasted objects in your collage to quickly select and rearrange your “collage” pieces. This also selects them in the Layers palette and allows you to manipulate them. Vary the SCALE of your square selections in order to create a Narrow Value Range composition that demonstrates RHYTHM/REPETITION, a sense of MOVEMENT, and an understanding of EMPHASIS and VISUAL HIERARCHY. Once you have completed your work, save an extra version as a JPG and email it to the professor via the Contact page. Print out a b/w laser print to add to your Creative Process Book. Bring all assignment parts to class, protected in a portfolio case or protective paper or cardboard envelope. In your Creative Process Book, at the end of the Assignment #2 section, document your thoughts about this project. Think about what you learned, what you could have done better (planning, material use, craft), and how you will apply what you learned to your next project.